Last year marked a significant milestone for renewable energy in Thailand where a total of 3 GW of solar installations were deployed in the country. This amounts to 50% of the 2036 target under the country’s current 20-year energy roadmap. 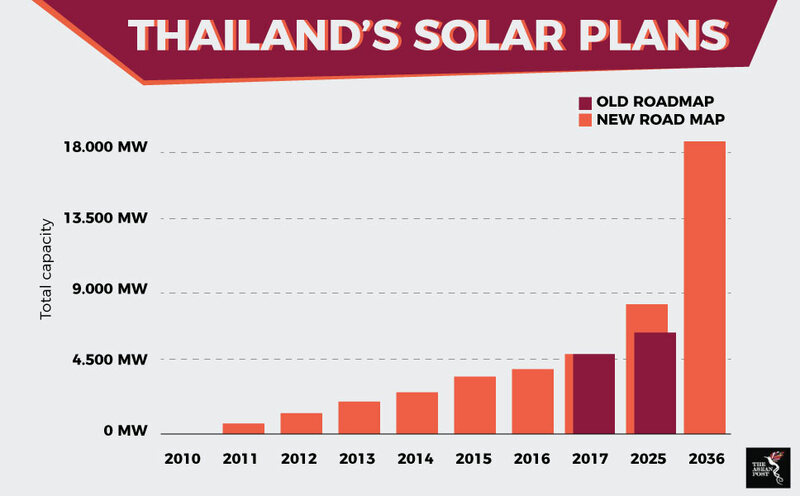 Thailand’s share in solar energy exceeds 60% of total installed capacity in the Southeast Asian region, followed by the Philippines, Malaysia, and Singapore. Thailand is currently continuing its integrated energy blueprint which consists of a gas plan, oil plan, Energy Efficiency Plan (EEP), Alternative Energy Development Plan (AEDP) and the Power Development Plan (PDP) together with the Smart Grid Plan (SGP). A 2017 report by the International Renewable Energy Agency (IRENA) in cooperation with Thailand’s Ministry of Energy, shows that the country has plans for further development this year. According to the IRENA report, the share of renewable energy in the country’s energy mix should increase to 37%. Under this new roadmap (REmap 2036), solar power alone should reach a total capacity of 17 GW by 2036 instead of the previously targeted 6 GW. This new target can be easily achieved taking into consideration decreasing solar panel costs and Thailand’s abundant solar energy resource potential. Some plans for solar include the deployment of more solar farms throughout Thailand, new investments in rooftop solar and the implementation of Internet of (Solar) Energy. Internet of Energy (IoE) refers to the implementation of Internet of Things (IoT) technology with distributed energy systems to optimise the efficiency of the generation, transmission, and utilisation of electricity. As soon as the necessary regulatory framework is in place to support a peer-to-peer energy trading community, any energy provider in Thailand will be able to sell energy directly, using blockchain technology and negating the need of a middleman. As for rooftop solar, a new legislation is to be introduced soon, which should result in the small rooftop solar quota increasing rapidly. The rooftop here is defined as a roof, deck, or any part of a building. The definition does not include wall, fence, banner or banner’s structure, parking area, U-turn area, access way for vehicles, or any similar structures. Solar rooftop installations on commercial, industrial, public institutions such as schools and hospitals, residential buildings, and offices are going mainstream with the introduction of non-utility offtake deals and the opening up of the energy market that allows for the sale of rooftop electricity on demand into the grid. Thai companies in the manufacturing sector can utilise rooftop solar not only to improve their green environment status but also to lower operating costs. This offers attractive opportunities as well, among others, for foreign investors in Thailand’s solar energy industry. Solar panels installed on private rooftops for self-consumption are already popular in Bangkok as well as in various production plants around the country. Owners of factories, buildings, and residences have installed solar rooftops to generate their own electric power and to cut back on energy costs. However, the rooftop solar potential in Thailand remains largely untapped for now. In order to maximise rooftop solar’s potential, the country must work to overcome several limitations. According to IRENA’s outlook for Thailand, the residential rooftop solar market has suffered the most, due to market dynamics that make installation unattractive to most homeowners. More economic incentives, such as a net metering scheme, would help grow the rooftop solar sector in Thailand. In addition to that, new business models using solar PV as part of an energy efficiency program for buildings to lower electricity bills could also speed up the adoption of rooftop solar PV. However, unlocking the potential of rooftop solar, would require stronger engagement from the country’s electricity generation and distribution providers, the Metropolitan Electricity Authority and the Provincial Electricity Authority. Since energy security is becoming a more pressing concern throughout the region, Thailand’s push to maximise its rooftop solar potential could serve as a model for other countries in the region and ultimately lead to a greener and cleaner Southeast Asia.